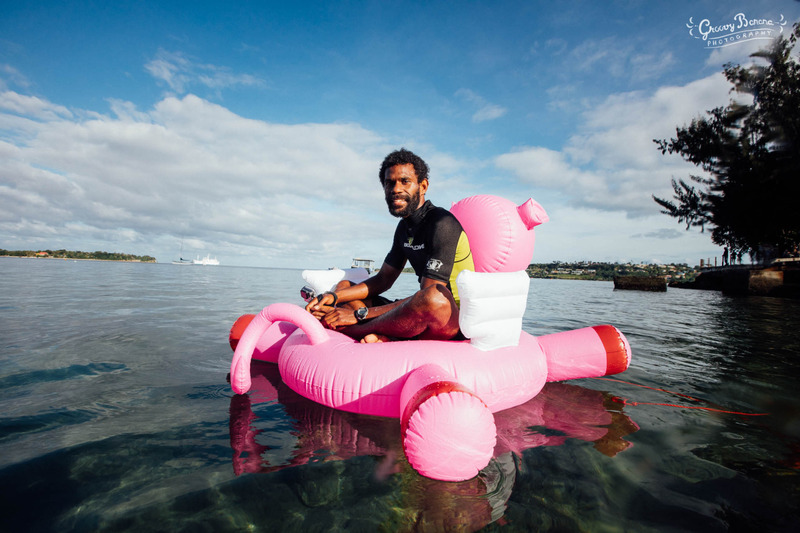 Following some Vanuatu kastoms where a “real” pig is tossed in to the ocean with villagers jumping into the water to reach the pig first, VAF organised a big inflatable pig to replace the “real” pig as the finish line of the swimming races and to encourage local competition in non-swimming communities. The Event was held down at the new Seafront wall with the new sea steps being utilized for the Piglets Race (Children’s Race). The race started at the new sea steps and ran along the sea wall which made for great spectator watching. The final stretch of the adult race was also run along the sea wall. The event brought attention from tourists and locals excited at the chance to win a pig. Overall VAF had 28 adults and 14 pikinini (children) registered for the event which was a great turnout with only having 1 week to promote for the event. Following the races was a come & try water polo demonstration, which proved to be popular amongst teenagers in Port Vila. As the game is a social and active game which combines swimming, handball and rugby to make one fast paced contact sport, it resonates well with the youth in Vanuatu. VAF would like to thank FINA for supporting the feration with celebrating World Aquatics Day. Without their support the federation would not have been able to cover the expenses needed for the event. Vanuatu Aquatics also thanks local corporate sponsors Vila Distribution who donated prizes, Nambawan Café, Bred Bank and Big Blue. Thank you to all the volunteers who helped organise the event and those who volunteered their time on the day. VAF is proud of the event and all the participants who took place and volunteers who helped on the day. The Federation looks forward to organising more Open water events later this year.